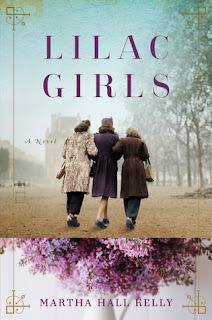 What They Say.....Inspired by the life of a real World War II heroine, this debut novel reveals a story of love, redemption, and secrets that were hidden for decades. What I Say....This has been the year of novels told from three different viewpoints. And I find that I like that style of writing, it seems to keep me more engrossed in the story, but maybe that appeals to my ADD nature. Which I'm convinced is being made worse by my dependence on my iPhone. I love a good WWII book, and this one is based in New York, Poland and Germany, where each woman is based. Caroline Ferriday is a real person, but the novel is still historical fiction. Kasia is a young Polish girl who gets involved the Resistance, but manages to get arrested on her first mission. Her mother and sister are sent to the concentration camp with her, and they spend the next years trying to simply stay alive. Herta, the German doctor, is trying to make enough money to live and practice medicine. Her dream is to become a surgeon, which is unheard of in Nazi Germany, so she is forced to practice as a dermatologist. But the war changes all that, as she is sent to a "Re-Education Camp". Although she may have not known what she was getting into in the beginning, she quickly realizes what is happening, but she does nothing to stop it and takes part in performing horrific surgeries on the Polish women, in the name of experimentation. Super sick. This was such a powerful story, and definitely a page turner, but it was even more fascinating to learn at the end of the story that it was based on true events and true women. It's completely amazing to know what that generation lived through and how they stayed both alive and optimistic about the human race.